Why Alan Wong’s is #1? 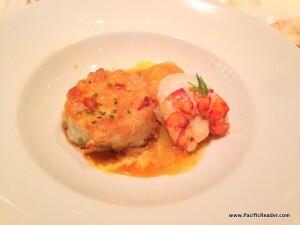 You are here: Home / For the Foodies / Best Of / Why Alan Wong’s is #1? Hawaii is well known for having excellent Asian cuisine and some of the freshest seafood in the world, but navigating the Hawaii food scene can really be a hit or miss experience. In my personal experiences, restaurants small or large can be pricey, have bad service, and can even have bad food. Visitors to the islands are always asking me where to eat and what are my favorite restaurants. I love to eat and critique, so of course I have several favorites from high end to low end price ranges, but there’s one restaurant name that I consistently recommend, Alan Wong’s. Cliche you say? But I don’t. 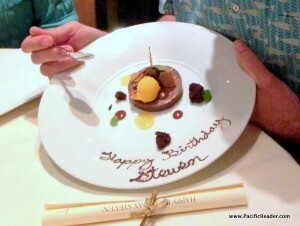 In my opinion, Alan Wong has earned the right to be one of the top restauranteurs in Hawaii and even in the world. So Why is Alan Wong’s #1? 1. Excellent Service: Not only Hawaii’s top service, but in my opinion Alan Wong’s Honolulu delivers mainland quality service. From the reservation call to the last dessert bite, Alan Wong’s staff are polite, suggestive, accommodating in every way, and make the dining experience effortless and unforgettable. 2. 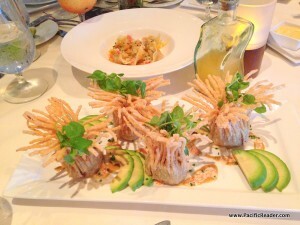 Unique and Original Dishes: When I see an Ahi poke or coconut shrimp on a menu at a new trendy restaurant I just shake my head. Can’t we come up with anything different? Alan Wong’s changes their menu regularly and consistently delivers crowd favorites in an unique and original way. Their “Poke-Pines” made with crispy won ton wrapped in ahi poke balls, avocado, and wasabi sauce was an excellent example of thinking outside the box and offering the customer something different and delicious. Also, they love to serve locally sourced ingredients like locally caught fish like Onaga and Opakapaka that rarely shows up on the menu at other restaurants. 3. All Food is Done Well: This one is a big one for me! I am tired of spending $20+ on a dish at some restaurants only to find that what you get may be hit or miss. If you order the wrong thing it might be the difference between a good experience or a bad one, and I feel that is unacceptable. All dishes should be equally great, and when you go to Alan Wong’s that’s exactly what you get. You don’t have dish envy with your fellow diner, but end up sampling and sharing. 4. 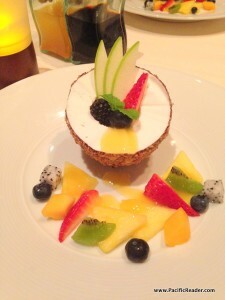 Desserts: I am not usually a dessert person, but my favorite dessert on the island resides at Alan Wong’s. I LOVE their “The Coconut” made with haupia sorbet in a chocolate shell served with tropical fruits and lilikoi sauce gets me every time. 5. Above and Beyond: It’s the little things that count, for example, their libations are offered on an iPad. Also, if you’re celebrating a special occasion like a birthday, Alan Wong’s will make sure to treat guest extra special by printing out a special birthday message to the diner on their menu and even giving a complimentary dessert. They even roll up the custom menu in a scroll for you to take home. Every time I visit Alan Wong’s I know I’ll be in for a delicious and memorable dining experience for not only me, but my entire party. It is definitely worth the splurge especially if you’re celebrating a special occasion. Thank you Alan Wong for always raising the bar for other Hawaii restaurants to follow. If you’re on a budget, don’t forget about the more affordable route with The Pineapple Room in Ala Moana Center.